The quarterly magazine is read by Hindus and non-Hindus who are spiritually or otherwise curious to explore the world’s oldest tradition. It is delivered around the world as well as carried in libraries, universities and temples. 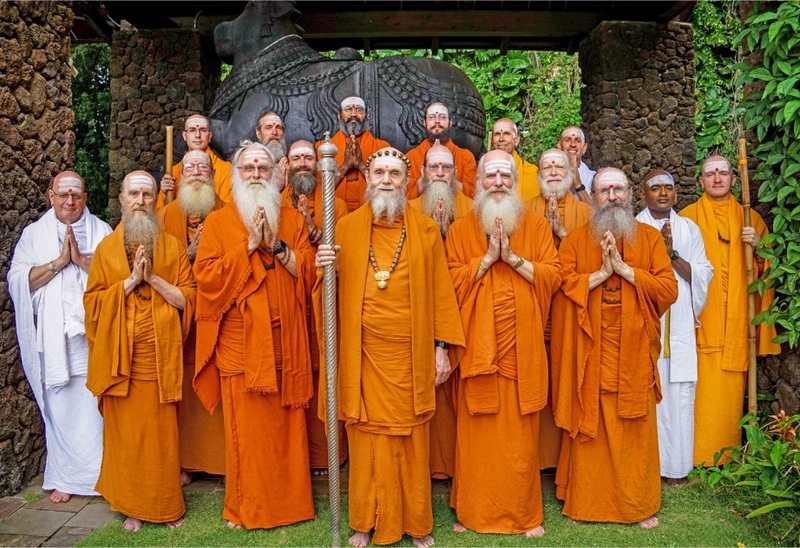 The monks of Kauai’s Hindu Monastery, in Hawaii, who have produced Hinduism Today continuously for 40 years. With over one billion people identifying as Hindus, Hinduism Today is a lifeline for many who struggle to sustain their faith in remote areas or are surrounded by dissimilar cultures. Its mix of articles on traditions of worship, meditation, yoga, mantras, scriptures, vegetarianism and Ayurveda helps keep their beliefs and traditions alive and strong. In a nod to the magazine’s reputation for credibility and authenticity, Houghton Mifflin, one of America’s largest publishers for children’s textbooks requested Hinduism Today to vet its chapters on Hindu Dharma. The magazine’s team rewrote the chapters and, to their amazement, the publishers adopted the rewritten chapters in their entirety. The White House has also tapped the monks for their views on the controversial subject of cloning. The articles, as Yoga Guru Swami Ramdev puts it are a “blend of spirituality, religion and science.” Both mystical and practical, they cover ways to bring peace and contentment in one’s life, techniques to progress on the spiritual path, different paths to the divine, karma, dharma and reincarnation. Two subjects are off limits – politics and economics. Some of the magazine’s most popular pages are the armchair pilgrimages to Bharat’s ancient temples where it uncovers their history complete with temple lore and significance because to quote Gurudeva “Temples provide food for the soul.” It is a rare resource that explains the temple function and the benefits to a devotee in clear and modern terms. Another regular feature is its inspirational spotlight on successful Hindus who stick to their core values even in times of adversity. A recent trend of younger Hindus leaning towards Hindu Dharma and exploring its philosophy is taken very seriously. Hinduism Today receives countless emails from teenagers wrestling with the religion of their parents or young adults questioning the existence of God. The staff reply to each and every letter. In addition, the magazine’s style is clear, contemporary, crisp, and articles keep its young readers in mind “because they are the future of Hindu Dharma.” It also features a guest editorial space where young people can question, debate and share their thoughts. In 1980, when Hinduism Today’s founder Gurudeva received a letter from a Hindu businessman in Mauritius about the unethical conversions taking place in the country, he visited Mauritius and inspired the Hindu community to stand strong in their faith. The effort proved transformative with many Hindus gaining a deeper understanding of their tradition and re-embracing many of their customs from wearing Bharatiya attire to performing pujas at home. Gurudeva and the magazine itself are recognized as one of the major forces that stemmed the tide of conversions and restored peace and mutual respect among Mauritius’s many ethnic groups. Hinduism Today recently launched a website where one can find images of rare masterpieces, sacred religious symbols, illustrated alphabets, depictions of Hindu deities and more – a valuable resource for historians, academicians, curators and cultural anthropologists. The magazine is available in Kindle, EBook, PDF, an App, and on its website www.hinduismtoday.com. As with most publishing houses struggling to cover costs, Hinduism Today too works on a tight budget. It welcomes donations to the Hinduism Today Production Fund which is a part of Hindu Heritage Endowment. Placing advertisements can help support the magazine’s publication. Another way is to subscribe with rates going from a yearly $35 to a current offer of a lifetime subscription rate for $299. Manu Shah is a freelance writer for Indian-American publications. She lives in Houston, Texas.